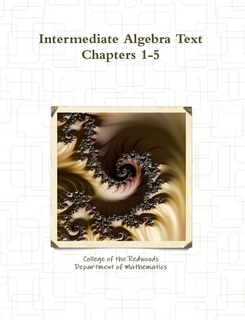 This textbook is used by the Department of Mathematics at College of the Redwoods in Eureka, California for instructional purposes in their Math 120 course, Intermediate Algebra. This text was written by the department specifically for use in Math 120. Note: The print book is in two parts. The order link above takes you to the first part (chapters 1-5). For the full book you also need the second part. Openness Comments: The authors do not provide copies of the editable source files for this text, so while it is easy to use as-is, it is very difficulty to modify or remix.